What a wonderful book for vegetarian and vegan kids! Jacqueline Briggs Martin and Melissa Sweet team up to create a playful adventure book about saving a chicken. 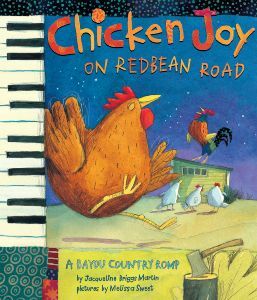 Set in the bayou, Chicken Joy on Redbean Road is the story of a rooster who lost his ability to sing. Because a rooster who doesn’t rouse the barnyard has no use on a working farm, the other animals realize his life is in danger. Thus, the hen sets out to get help from the most powerful man around — a renowned musician — while an anonymous animal keeps distracting the farmer by putting vegetables in her path, which causes the farmer to focus on cooking her stew before she slaughters the rooster. The hen, the musician, other neighbors, and the animals all end up saving the rooster’s life by having a huge party/ concert in the barnyard — which distracts the farmer and inspires her to sell vegetable stew (without any rooster). At the end of the party, all the farmed animals are mysteriously gone — and there’s a suggestion that they may have gone to live with the musician. Ages 4-8. To learn more about the zydeco music that’s featured in the book, visit McBookWords.